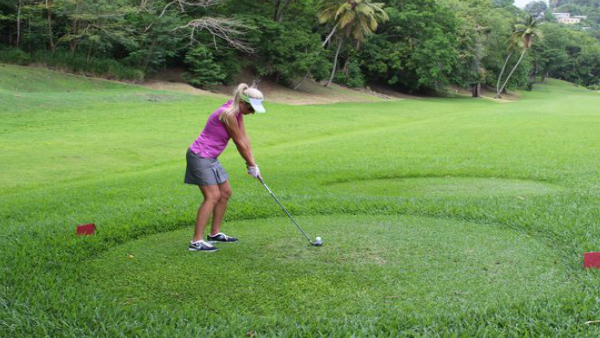 You might believe that all-inclusive golf vacations are created equal, especially to the Caribbean. Unlimited rounds on some of the finest courses in the world can be nirvana for golfers and without the extra costs for cart rentals, clubs and green fees, it’s a win-win for any golfer. Luckily for you we have a trio of amazing all-inclusive golf vacations that won’t break the bank. Like the catchy slogan “It’s Better in the Bahamas“, the course at Sandals Emerald Bay Golf, Tennis and Spa Resort is one of the premium seaside golf courses in the world. The showpiece in Great Exuma, the golf course is a Greg Norman (aka. The Shark)-designed 7,001-yard, par 72 with 5 sets of tees and a six-pack of signature holes that snuggle the picturesque perimeter. Aptly called Sandals Emerald Bay, the course is known for its fairways that challenge golfers of all skill levels as the trade winds keep the round challenging. On the front nine you will play through a melange of ocean view dunes while a shoreline jogging trail along the back nine are for those looking to burn off those vacation calories. 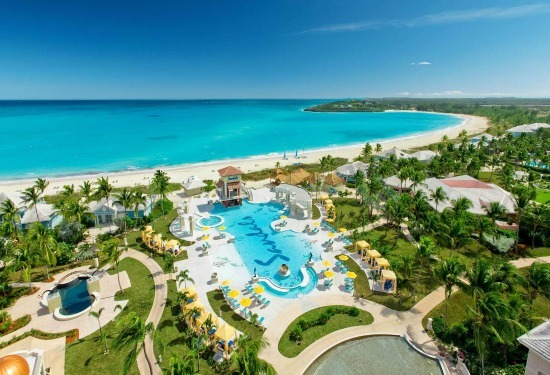 It is billed as the ‘longest course in the Caribbean’, Sandals Emerald Bay is familiar to golf fans as the host of the Web.com tour stop the Bahamas Great Exuma Classic. Want some help with your game? Or you want to get into learn the game of golf? There are private lessons available. Work on your short game as there is a chipping and putting green area. If you decide to leave your sticks at home, TaylorMade clubs for men and women are available to rent. For 3 nights you can stay at a luxury-laden adult-only all-inclusive which includes 2 rounds of golf which includes green fees while for those looking for a longer stay, book 7 nights or a stay in a butler suite for unlimited rounds and green fees on the house. Back at the 249-room, suite and villa resort, all-inclusive means Olympian-sized with 11 restaurants, 3 pools including a zero-entry with a fire pit in the middle, 2 whirlpools, 6 bars, snacks anytime, unlimited first-rate pours and airport transfers. Yes, there are plenty of things to keep you busy at the resort, however, golfers with a sense of adventure go the distance and explore off the resort. A variety of tours are bookable at the front desk like the Island Routes Adventure Tours excursion called ‘Exuma ATV Explorer” that takes roadsters to see St. Margaret’s Anglican Church built in 1848, the first prison built on the island and the caves at Rolleville where locals like to talk about its pirate past. Seal the deal at Cocoplum Beach for local sips and snacks on the sand. For couples looking to land the big one, ‘Bone Fishing’ is a full-day tour on the Super Skiff as the Captain navigates the shallow waters aiming to land the elusive ‘silver ghost’ fish. A timeless classic, Runaway Bay Golf Club is a par-72, 18-hole course that’s been challenging golfers for more than half a century. 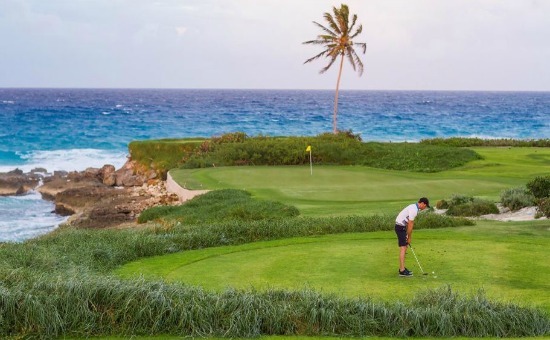 For those staying at the Jewel Runaway Bay Resort Beach & Golf Resort, there’s plenty of good times when playing this course as there is complimentary green fees and unlimited play. Designed by British Major John Harris, the course opened in 1960 and has hosted many prestigious events from the Ryder Cup match between the United Kingdom and West Indies, Heineken World Cup Qualifier, Jamaica Open, CNBC Nations Cup. Also open for play to non-guests of the resort, the course measures 5,389 yards with a slope rated 117 from the forward tees and from the tips, the course comes in at 6,870 yards and is slope rated 124. The highlights of the course include well manicured and inclined fairways with sizable flat greens protected by sand bunkers. Make the Club House your 19th hole a must do stop with an open-air restaurant for breakfast and lunch the bar is the place to add up the scores and settle any bets. For those who love early morning tee-times, the Pro Shop opens at 7 am with an array of accessories like gloves, golf wear, shoes and sunblock. Beds for heads suit varying budgets with recommended stays including Junior Suites that come with plunge pools and a personal concierge and the top-of-the-line Plunge Pool Butler Suite with ocean views, expansive balcony, 24-hour room service, his-and-her robes and a butler who keeps things neat. Upping the all-inclusive golf vacations option ante, there are massages in the Radiant Spa and en-suite check-in. 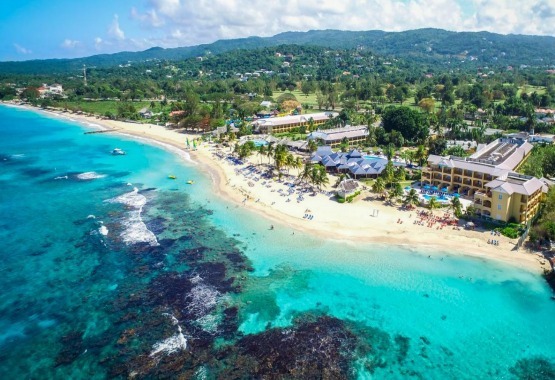 Must-haves run the gamut from airport transfers from the Sangster International airport in Montego Bay, Wi-Fi that works on the beach, pool concierge and a Kids Club and Teen Lounge for golfers who come with kids in tow. The active crowd enjoy unlimited time in the Fitness Center, windsurfing, snorkeling, kayaking and tennis. To keep hunger at bay, 7 restaurants dish up a variety of gourmet edibles like Aquamarina where bare feet and bathing suits are welcome, Blue Bayou in the Lagoon Waterpark for salty dogs and for the indecisive, Coral Café is the buffet go-to steps from the pool. Eat local at Platinum with haute and spicy island fare and for those with a yen for Asian, Golden Saber Sushi is the real deal. When the sun sets, Jade Samurai heats up with teppanyaki dining and table side entertainment. Go the distance off-the-resort with the popular ‘Dunn’s River Falls and Green Grotto Caves’ tour offered by Excursions in Jamaica. Between the resort towns of Montego Bay and Ocho Rios, the caves are a natural wonder with intricate rock formations, stalactites and stalagmites. An energetic day on the island continues at the iconic falls in Ocho Rios where the brazen and the brave climb a staircase adjacent to the falls and a climb up to the steep falls. 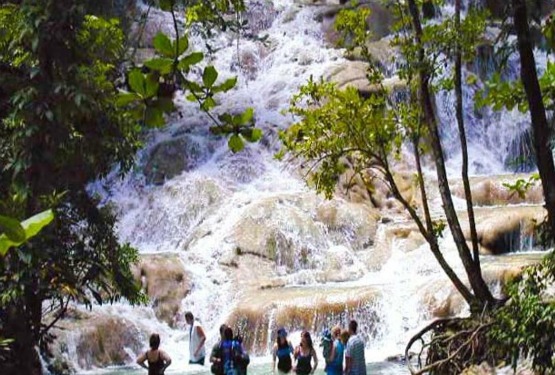 For those not inclined to climb, the park at the Falls is a day at the beach with a craft market and food court.https://excursionsinjamaica.com/. For an all-inclusive golf vacations spot this is a glamorous resort set on 220 acres, Sandals Regency La Toc is one of 3 Sandals all-inclusives on the island just west of Barbados. Fronting a perfect beach, the resort is Instagram-worthy with coral bluffs, blossoming hillsides and fairways that disappear into the horizon. 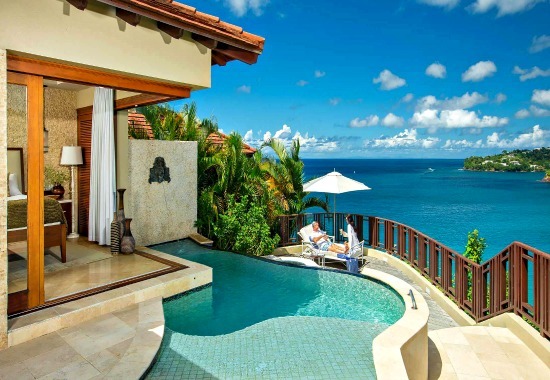 Wooing vacationers with five-star pampering in oceanfront suites, 9 restaurants and a Stay at 1, Play at 3 programs, the resort is tops with those who come to golf at 2 courses; Sandals St. Lucia Golf & Country Club at Cap Estate and Sandals Regency La Toc Golf Club. Green fees are included at the on-site Sandals Regency La Toc Golf Club for guests of the resort and at nearby Sandals St. Lucia Golf & Country Club at Cap Estate with a stay of 6 nights or more. Upping the all-inclusive lure, the swanky resort pours unlimited premium spirits at 8 bars including swim-ups, Robert Mondavi Twin Oaks vino is stocked in the rooms. And there are water sports like, kayaking, scuba and snorkeling are included. The tennis courts are lit for night play, airport transfers are gratis, live entertainment is top-notch and exchange privileges are on the house at the 2 nearby Sandals Resorts; Sandals Grande Lucian 25 minutes away and Sandals Halcyon Beach, 15 minutes from Sandals Regency La Toc. Not for the faint-of-appetite, a total of 27 restaurants and too many bars to count are open at all 3 resorts. 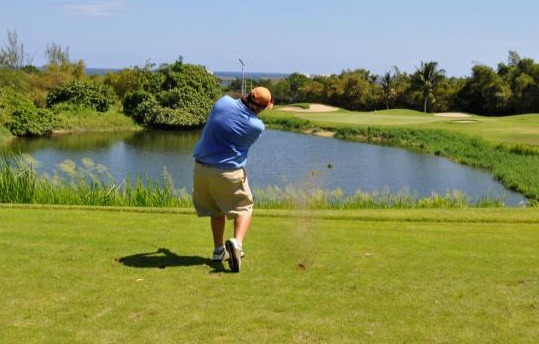 There is a nice variety on the 2 courses to challenge any high or low handicap golfer, first is the short resort 9-hole Sandals Regency La Toc Golf Club, which plays about 3,300 yards. Be ready for narrow fairways along with sprawling hills that cradle a scenic valley which are surrounded by green hills, villas, almond and bamboo trees. You will want to play this course if you are looking to challenge yourself as several holes call for pinpoint shot making so make sure to choose the right club. Not much room to make mistakes all due to the tight layout. A free Golf Clinic is offered once a week and golf lessons are available for a fee. The 18-hole Sandals St. Lucia Golf & Country Club at Cap Estate is at the island’s northern tip. 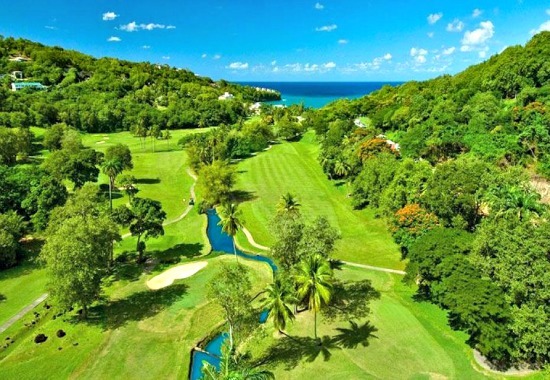 This picturesque 6,744-yard layout of rolling green slopes, has views of the Caribbean Sea and the Atlantic Ocean. Orchids grow wild on the course that is also home to a variety of wildlife. One of the course’s signature holes is a tricky par-4 opening hole which features a water hazard guarding the right side of the fairway while elevated greens and uneven lies keep golfers on their toes. At least for a day, discover the island away from the resort. A plethora of options await adventurers like the ‘Explore Catamaran Cruise ‘along the western shoreline. Snorkel the reef where a kaleidoscope of tropical fish poses for underwater snaps while the on-board Chef prepares a succulent lunch. After lunch, paddle boarding is fun while sunning on the boat is perfection for the rest of us. More action on land with the ‘Dune Buggy and Zipline Combo’ tour that comes with a 2-seater buggy for cruising the east coast to the interior of the island where Treetop Adventure Park invites with the fastest zip line on the island. For maximum thrills, finish the 12 lines, toast success with a fruity cocktail and enjoy a spin through the gift shop.